Google to introduce paid YouTube channel subscriptions this week? YouTube could unleash its long-rumored plans for paid monthly subscriptions as soon as this week, according to a report in the Financial Times. The subscriptions could apply to around 50 channels, with viewers able to subscribe from a starting price of $1.99 a month (around UK£1.27, AUD$1.94), the report claimed. The subscription fees would boost revenue for Google, but could also allow content creators to invest more in the quality of their YouTube broadcasts. The FT added that the channels could become home to full, original TV shows and films, putting YouTube in competition with the likes of Netflix, Hulu and Amazon. 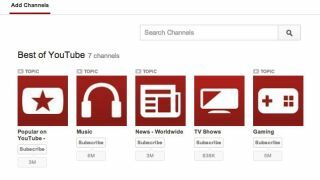 There's no real indication yet which channels will go behind the YouTube paywall, but the streaming site has enlisted many high profile partners, in its push to become a home for original content. The idea of paid YouTube subscriptions isn't a new one. The company has been toying with the idea since 2011, and earlier this year, the company reiterated it was looking at new payment models for certain content.